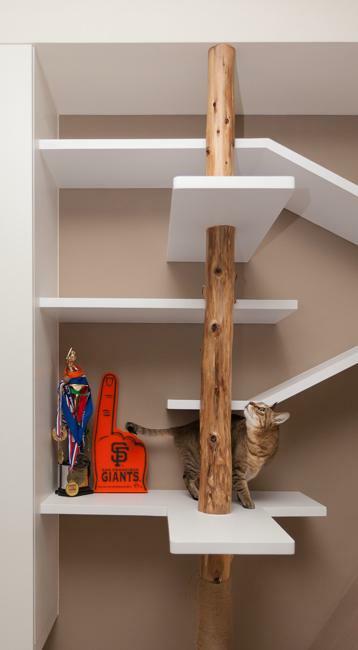 Wall shelves are wonderful ideas creating playful furniture for cats. Lushome presents inspiring wall shelves envisioned by Taiwanese design firm Thinking Design, offering an original way for personalizing home interiors and building cat-friendly walls. The wooden shelves add attractive vertical spaces, perfect for cats or extensive book storage. Decorative and functional, these wall shelves provide great inspirations for DIY enthusiasts, owners of large home libraries, and all pets lovers. 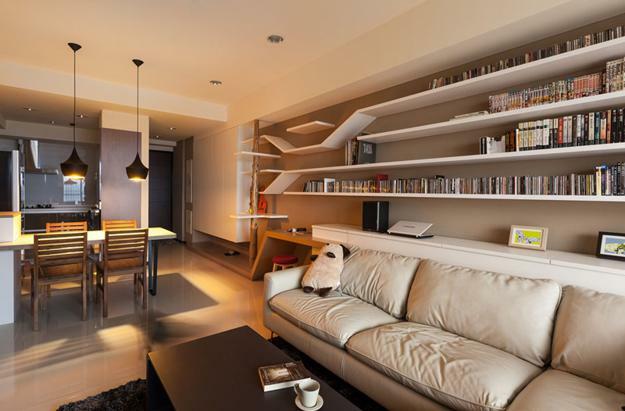 The shelving arrangement can be spectacular or just elegant and functional. Modern wall shelves give character to interiors and improve rooms turning them into inviting and cat-friendly living spaces. The space saving shelving system designs versatile and comfortable rooms for people and pets and includes the catwalk offering a great alternative to traditional pet furniture. Cat-friendly wall shelves are excellent for family felines and add a unique look to interior design adding visual interest to a room. 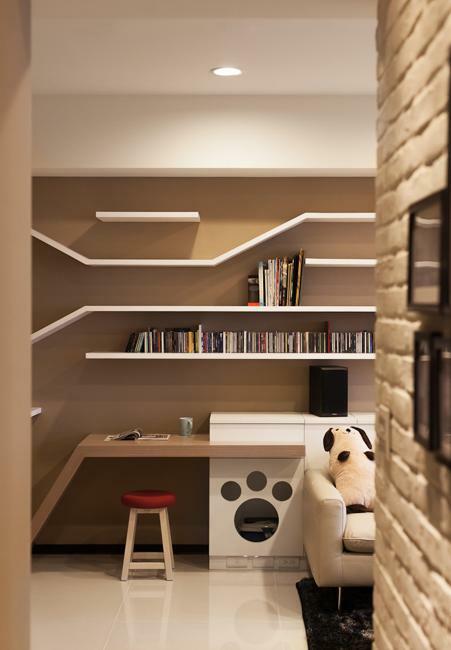 Mixing bookshelves with pet furniture, the shelving design creates the walls with extensive catwalks which seem endless. They give a continuous and contemporary look to the walls. The shelving units organically connect walls while improving storage spaces and personalizing interior design. A cat tree can be integrated into the shelves providing ideal cat furniture item for scratching and exercises. It can be placed in the corner to add a vertical element that helps cats climb the different levels and walk or sleep on the shelves. The wall shelves mounted at different heights let cats have a panoramic view of the living spaces, feel safe and comfortable. The horizontal, inclined, and vertical elements of the wall shelving system keep cats active, happy, and healthy. While adding more fun to the unusual, and playful environment, the extended shelving systems provide gorgeous storage spaces for books. Using vertical spaces for building bookshelves and cat furniture are a perfect idea for decorating small apartments ad homes. If you are DIY projects enthusiasts, steal the look of the innovative and modern wall shelving, or think outside the box to develop unique pet furniture pieces for cats in your home. Following your imagination and using the inspiration, you can add unique accents to your interior design, transform any dull room into exciting, and make your living spaces cat-friendly. The custom wall shelving systems can combine modern shelves with rustic wood posts which beautifully accentuate contemporary interiors. 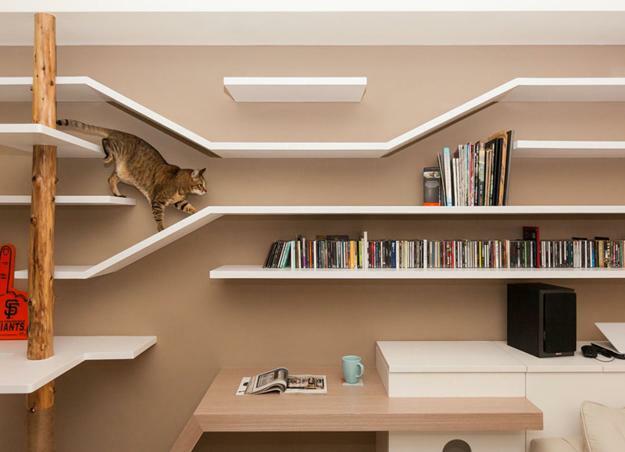 Creative wall shelves and original solutions work well to spice up modern interiors and make your cats happy. You can buy a cat tree or design an original piece to add beautiful cat furniture to your wall shelving. 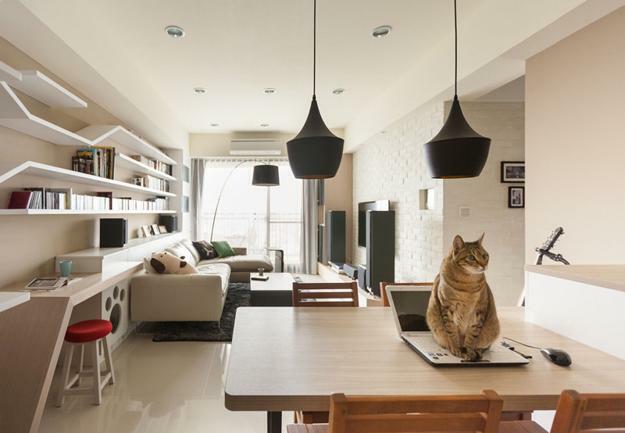 Your cat will like the playful combination of vertical elements and horizontal surfaces that remind the tree branches.